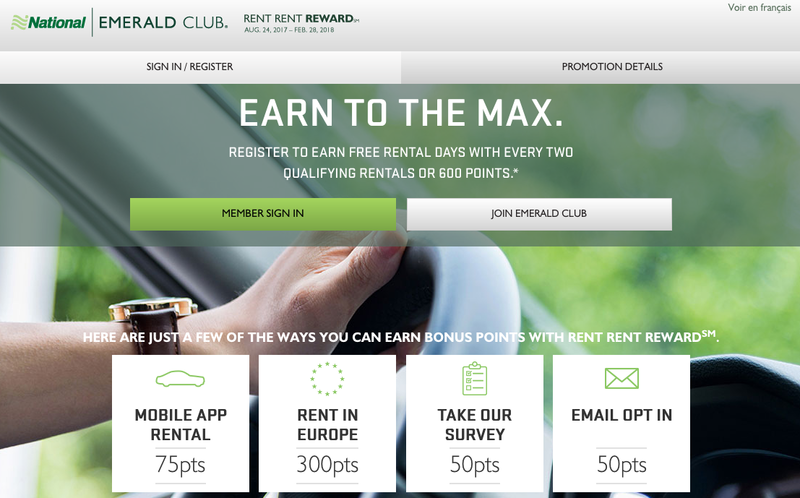 One of the best Car Rental Reward program promotions, National Emerald Club's One Two Free (US, Latin America, Caribbean) / Rent Rent Reward (Canada) has returned. Once again there is a U.S. version which now also includes Latin America and the Caribbean and a Canadian version. The Canadian version is slightly better than the U.S. version on the rental portion as Canadians can credit Canadian rentals towards the promo whereas their U.S. and Latin American counterparts cannot. You can also earn points for opting in for emails, downloading the mobile app and more. Mobile App Download: One-time bonus of 25 points when you download the National Car Rental App. Mobile App Rental: 75 points when you reserve using the National Car Rental App and complete the rental. Email Opt In: One-time bonus of 50 points when you opt in to receive Emerald Club emails, which provide useful information, special offers and savings opportunities. Opt In: Virtual Credentials: One-time bonus of 50 points when you opt in to your next membership kit electronically. Weekend Rental: One-time bonus of 100 points when you rent 2-4 days with a Saturday night keep (in addition to the points you earn for completing a Qualifying Rental. Weeklong Rental: One-time bonus of 200 points when you rent for 5 days or more (in addition to the points you earn for completing a Qualifying Rental). Neighborhood Rental: 200 points when you rent with Enterprise Rent-A-Car at neighborhood locations (excludes airport locations). Limit to 3 bonuses for up to 600 points. Emerald Reserve Service: One-time bonus of 25 points when you access the Emerald Reserve Service to receive a specific car class – Convertible, Minivan, SUV or any other vehicle. Available only at major airports throughout US and Canada. Latin American or Caribbean Rental: 300 points when you rent at participating locations in Latin America and the Caribbean. To find participating locations, visit our site. Rent in Europe: 300 points when you rent at participating locations in Europe (through Enterprise Rent-A-Car). To find participating locations, visit our site. Take Our Survey: 50 points when you complete a brief Emerald Club survey. Earn 5 Bonus Opportunities: One-time bonus of 75 points when you complete any 5 available bonus opportunities on your dashboard. Make 3 Rentals: One-time bonus of 100 points when you complete your third Qualifying Rental.